EventLog Analyzer facilitates real time file integrity monitoring (FIM) by protecting sensitive data and meeting compliance requirements. 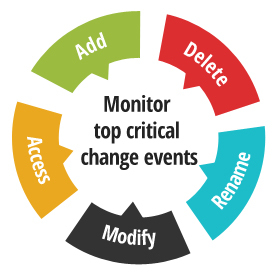 With EventLog Analyzer's file integrity monitoring capability, security professionals can now centrally track all changes happening to their files and folders such as when files and folders are created, accessed, viewed, deleted, modified, renamed and much more. They can even have real time alert notification upon changes occurring to their files and folders.The critical information provided by EventLog Analyzer's FIM feature allows users to make quick decisions and mitigate the risk of data breaches. Total File Integrity: Runs a thorough check on files and folders to determine if they are intact by scanning the contents, attributes, permissions, ownership, size, etc. Get Real time Alerts on Critical Changes:Get instant alert notifications for critical changes occurring on the files and folders. Complete Audit Trail: Get a complete audit trail of all the changes that happen on files and folders. Audit trail answers the 'what, when, where and how' of all changes in real-time! Meet Compliance Requirements: File integrity monitoring allows organizations to meet critical compliance requirements mandated by regulatory acts such as Payment Card Industry Data Security Standard (PCI DSS), Sarbanes-Oxley (SOX), Health Insurance Portability and Accountability Act (HIPAA), Federal Information Security Management Act (FISMA), etc. File Integrity Reporting and Scheduling:Generate exhaustive reports with precise integrity details. Reports could be generated in multiple formats such as PDF,CSV and much more. Flexible report scheduling allows you to automatically get the reports at regular intervals. Get 1000+ predefined reports for Windows, Unix/Linux, applications, & network devices environment that help to meet security, auditing, & compliance needs. Build custom reports for specific needs at ease. Detect anomalies, threats, and data breach attempts with real-time email/SMS alerts. This tool comes with meticulously drafted 700+ alert criteria plus a wizard to create custom alert profiles at ease. With EventLog Analyzer's real-time correlation engine, proactively mitigate security attacks. The solution has 70+ predefined rules on file integrity, user activities, malicious program installation, and more.